After six months of guiding readers through the stormy seas of love, I have decided that, with the new year, it's also time for me to move onto new adventures. Don't worry. I'm sure you'll still see me around The Escapist here and there. But this will be the last Love FAQ column that I write. First off, I must thank you, my readers, from the bottom of my heart. This column wouldn't have amounted to anything without the wholehearted support of The Escapist community, and you all embraced the concept with gusto. Over the past 27 weeks, I have received nearly 350 letters, and my only regret is that I won't be able to answer each and every one of them in turn. As it is, I'm delighted to have had the chance to answer as many questions as I did-from how to tastefully gamify a wedding reception to how to deal with an abusive ex to how to avoid the friend zone. I received submissions from readers of all ages, backgrounds, and sexual orientations, and it was with no small pride that I read feedback from several of you who said that the advice I gave in these columns genuinely helped them make critical life decisions. You didn't always agree with me-in fact, some of you rarely did - but each column was a joy to write, and every week, I looked forward to reading your feedback, both in the comment sections and in my inbox. Love isn't nearly so complicated as we make it out to be. Relationships aren't a game you can min/max. Neither are they deadly serious matters of life-and-death. Love is about joy, companionship and comfort, and its purpose is to make both the dark and light parts of life seem a little brighter in comparison. Good relationships are rarely ever effortless, but the work you put into them is generally its own best reward. Good relationships can be distilled to a few key ingredients: Trust. Respect. Communication. Especially communication. If problems arise in a relationship, 90% of the time they can be fixed simply by talking more - whether to each other, to a therapist, or simply to the man or woman in the mirror. I once wrote that we are all a little broken inside, and that the secret to lasting love wasn't finding that perfect someone, but rather that special someone whose broken parts fit against your broken parts. True, that can seem no less daunting a task, but here's the other half of that advice: We're all on this road together. We all want to find love, to help each other out and be helped in return. So treat people as you would care to be treated, and you will find that those around you will generally answer in kind-which maybe isn't the newest counsel, but it still rings true. Finally, one more last word of advice: Whatever troubles you, no matter what it is, this too shall pass. All things in life and love are temporary. So if things in your life are going well, then savor this moment as fervently as you can, for it will end sooner than you think. And if things in your life aren't going so well, then don't fret, because likewise this moment will end soon as well. With that, goodbye, good luck, and remember: Don't stick it in the crazy. 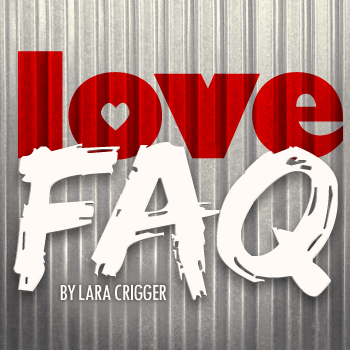 Disclaimer: LoveFAQ is written by Lara Crigger, who is by no means a trained psychiatrist or therapist or even a middle school guidance counselor - just a smart gal who wants to help out her fellow geek. LoveFAQ is meant for entertainment purposes only, so don't take it as a substitute for professional advice. If you have real problems, consult your physician.